Maria came into the picture about a year ago when we met her in Uganda. She is part of the Karamojong tribe that lives in Moroto, Uganda. This tribe can be very violent to get what they want from people. Traditionally they are animists and believe that all the cattle in Africa belong to them. Therefore they steal cattle from neighboring villages and sometime kill the people who get in their way. The Karamojong spend a lot of time drinking and high on drugs. Women will put their kids on the street to beg. The mothers will stay in the village and the young children will walk miles a day to beg for money by themselves. This is the state that I met Maria and her children, (Phillip, Angela, Longoli and Michael (whom I have never met)). Maria’s husband had been murdered and she was left alone in the slum to care for her four kids. One day while Philip (7 yrs) and Angela (1 yr) were on the streets begging, the police came, as they commonly do, and picked them up and put them in the “Children’s Prison, ” a place for kids who beg. The police are trying to keep the streets clean of beggars and the Karamojong. Angela was very sick and she and her brother Phillip, had to be removed from the prison and ended up at a ministry that helps sick kids. Maria, over time, found her children by word of mouth and by the popular ministries, the locals in this region, know about. When I met Maria, she was a hopeless woman, filled with fear, anger and sorrow. She sat on her mat day and night. She was angry and mean to her children. She didn’t cook for them or clean. Sometimes she would slap Phillip and Angela in the face and yell at them. Maria did not know Jesus but had heard of him. She only spoke her language, Karamojo and a small bit of Swahili. As God would have it, on my trip I got very ill from the beginning. I had big plans for my 2 1/2 week stay, to visit Uganda and Kenya. First, I had a bad stomach bug and then Scabies. Pastor Cyrus (in Kenya) had come down with a bad case of malaria and could not travel either. So we were stuck. I spent many days with Maria and the kids using sign language, singing and playing. But because we were leaving in a few weeks, Maria became even more hopeless with no plans for the future and no one to look after her. In the mean time, brother Cyrus, decided that he was going to come and see me regardless of his health. He spent a few days with me and got to talk with Maria. After some discussion we asked if she could live with Cyrus. She had nothing and no one, and her kids were going back to the street so she could earn money. Cyrus agreed and asked Maria, she agreed as well. We packed up the few belongings that Maria and her children had and took them all to the bus station and saw them off. 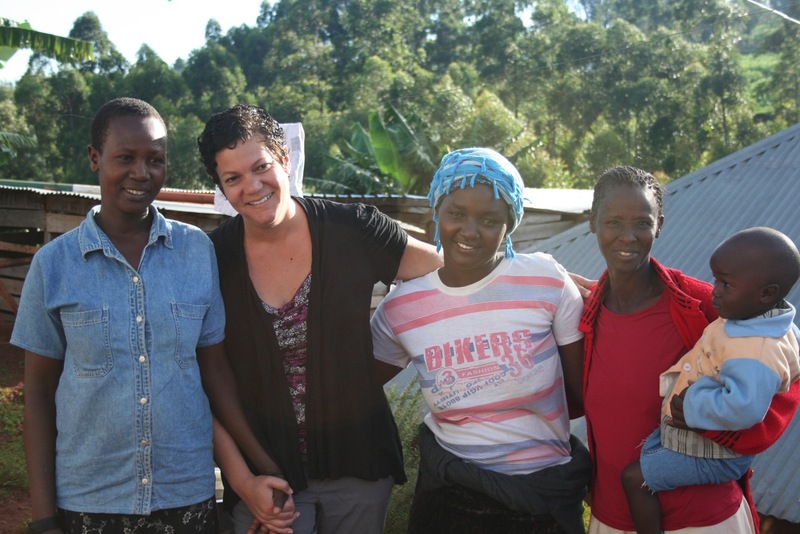 Maria and the kids have been in Kenya with Cyrus for one year now. At first she would ask for alcohol and drugs, they of course refused her. She has lived on the compound with Cyrus and his wife Eucabeth working with the kids, serving meals, cleaning and helping where needed. When I arrived in Kenya just a few weeks ago, you can imagine my excitement to see our African “family.” I was seated in the back of a ten passenger van. Maria, saw me and begin to yell “Mommy, Mommy!” (That is what we call each other). I managed my way out of the car and joined her, jumping up and down for joy! Over the next week I saw something that only God could have done, transform a life. The Karamojong are a hated people among the other tribes. They are not easily welcomed among others. Not only did a miracle take place with her transformed life, it took place in the lives of others who excepted her! Everywhere we went people of the community talked about what a wonderful person Maria was and how they were so please to have her in the community. The family in the compound treated her like she was one of their own. They loved on her kids, just like they loved on the other kids in the orphanage, and loved on Maria, just like she was a sister. Over a weeks time, I also noticed that Maria had pure joy deep down in her. She was happy, sang songs, played with the kids, helped them bath, dressed them for school and kept up with the duties of the compound. Her kids were smiling and interacting nicely with the other kids. Maria had life in her like I hadn’t seen before. She is completely free from drugs and alcohol. Her life has purpose and she is a hard worker! She sings songs about Jesus with the kids and wears a smile most of the time. She is still a little stubborn (according to Eucabeth) but is loved by Cyrus and Ecuabeth and a vital help to their ministry. God has so graciously changed Maria’s life and the life of her children! He has also mercifully changed the hearts of the people working with Pastor Cyrus. God is so good all of the time. Maria and her children will be worshiping at the feet of Jesus and I am praying, that I am kneeling right there next to her! This entry was posted in Updates and tagged Karamojong tribe, Kisii Kenya, Orphanage, Street Kids. Bookmark the permalink.